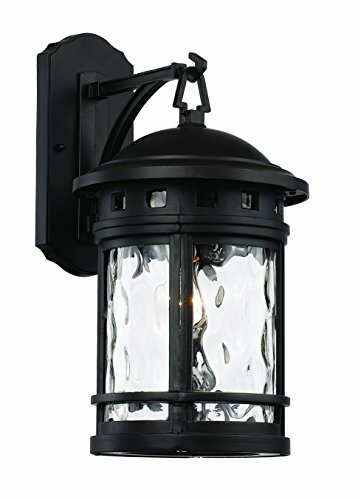 Trans Globe Lighting 40371 BK Outdoor Boardwalk 16.25" Wall Lantern, Black | Fountain City Art Ctr. The Boardwalk Collection exhibits a unique wall lantern that is perfect for adding supplemental lighting to any outdoor living space. The Nautical theme allows the lantern to stand out as both functional and decorative as it lights up any outdoor setting. This fixture blends a durable metal frame with Clear Water Glass, providing a unique combination. The glass adds beautiful, soft reflections to the areas it shines on. Bulb Type: Incandescent. For Outdoor use. Type of glass is Water. The materials used are: Metal, Glass, Electrical. The Finish is Black. Bulb base is E26. The bulb is not included. This item is dimmable. The bulb shape is A19. Wet listed. Warranty details: One year limited Warranty. If you have any questions about this product by Trans Globe Lighting, contact us by completing and submitting the form below. If you are looking for a specif part number, please include it with your message.